Kakuro is a puzzle game that's a cross between both traditional crosswords and Sudoku. Just like Sudoku you must fit the digits 1 to 9 into a grid of squares so that no digit is repeated within a defined area. And just like a crossword there's a grid of filled blocks and clues to solve. 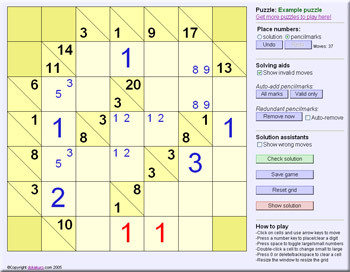 In Kakuro, there are across and down clues, just like in a crossword, but they give the sum of the digits in the relevant areas - which is why the puzzles are also called Cross Sums. The clues are written within the grid, to the left or the top of the area they apply to. 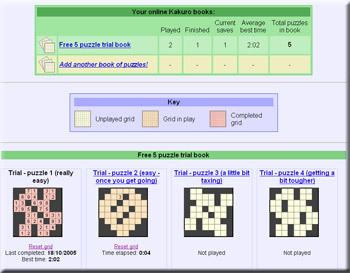 Or visit PuzzleMix.com to play Hanjie, Futoshiki, Sudoku and variants, Slitherlink, Hitori and more. Playing Kakuro in our unique player is much easier than with pencil and paper. You can place both solution and pencil mark digits (working to help you decide which numbers go where), and you can resize it as big or small as you like. Plus you can even save your game - complete with pencil marks - and come back later. Want to jump straight in? Then just click here. It's not as hard as it sounds, since it only ever uses very simple addition. And if even that's too much then we have a handy reference that contains all the maths you'll ever need! Sign up for a free account on dokakuro.com and not only do you get more free Kakuro puzzles to play in our unique player, but you also get access to our puzzle browser. The browser keeps track of all your books, showing you not just what puzzles you have played but also which you've completed - and which have current saved games. Saving your game is just like writing in a book or newspaper and then putting it down for a while - when you come back everything is still there, including any pencilmarks you've made! You can even access your saved games from any computer you choose to log in on.